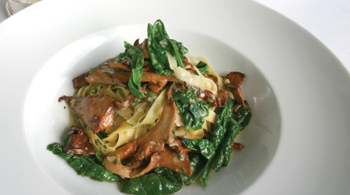 It's Easy Being Green: One Village Pub special combines tagliatelle with savoy spinach and chanterelles. THE DOTCOM boom was the golden age for Bay Area restaurants. Flush with cash and a taste for fine food and wine, the newly anointed class of well-heeled techies helped spur an unprecedented efflorescence of restaurants. If you had money, or at least an expense account and a stock option-fueled illusion of wealth, the Bay Area was a heady gastronomic playground. But when the boom went bust, the receding economic tide sank a number of restaurants. Many of the restaurants that survived this culinary Darwinism emerged leaner, smarter and better equipped for the long haul. Woodside's Village Pub is a particularly vigorous survivor. It was a beloved Woodside institution for decades before the dotcom boom, but it really came into regional prominence after reopening after a three-year hiatus in 2001 and reinventing itself as a fine dining restaurant. The restaurant's timing was good. Woodside had long played the role of a West Coast Hamptons to San Francisco and Silicon Valley, a country escape complete with equestrian trails and weekend retreats. With venture capitalists swarming over the town and diners looking for places to toss around their Am Ex gold cards, the Village Pub fit the bill. Of course, it was chef Mark Sullivan's unpretentious but refined French-influenced American food that really packed them in and made the restaurant a Bay Area destination. Five years later, he still does, and it still is. The restaurant is no more a pub than Woodside resident Larry Ellison's 23-acre compound is a single-family residence. While there is a beautiful mahogany bar warmed by a stone fireplace, the place has the look of a private men's club. From the dark wood-beamed ceiling to the plush booths and the glowing fireplace between the dining room and the kitchen, the Village Pub's dining room is one of the most beautiful and inviting around. But, again, it's the food that continues to make the Village Pub such a standout. The restaurant gets much of its produce from a nearby 17-acre farm, and it shows. The ingredients pop with a just-harvested freshness. Take the lettuce salad with white bean and tapenade crostini ($9). The buttery, crisp lettuce was perfectly dressed in a restrained vinaigrette that let the green leaves shine through. The creamy richness of the white bean purée and salty bite of the olive-based tapenade complemented each other perfectly. The warm cabbage salad sautéed with thick bits of bacon and chanterelle mushrooms ($9) tossed in tangy mustard dressing gets my vote for best winter salad. It's a simple dish and simply outstanding. Crispy sweetbreads with soft poached egg ($15) is one of the restaurant's signature dishes and for good reason. Like a fried oyster, the sweetbreads (the thymus gland of a cow) are crisp on the outside and velvety rich inside. The poached egg that rests on top gilds the lily, but the viscous brown butter vinaigrette offers just enough acidity to balance out the dish. If you've never had sweetbreads, this is the dish to try. If you have, this is as good as it gets. The beef daube ($29) is perfectly suited to a cold winter night. Made with beef shoulder that had marinated for three days and then lovingly braised in red wine and vegetables, the meat was incredibly rich and tender, while the accompanying cauliflower mousse was a creamy dream on a spoon. The duck confit is another wintry winner. The duck-leg meat was so tender is almost melted on contact with my mouth. Duck confit can often be too salty, but not here. The caramelized beets and turnips and leaves of bitter greens in an apple cider gastrique (a sweet and sour vinegar-based sauce) each sang their own clear tune but blended harmoniously into the whole. Fish and seafood are particularly good at the Village Pub. I loved the pan-seared Alaskan butterfish ($33), also known as sablefish or black cod. The fish was indeed buttery. It was topped with a fennel and piopino mushroom broth that our server spooned over it from a small copper pot. Add it all up and it's a subtle but great dish. The one disappointment was the pub burger ($11) on the lunch menu. While it was cooked to a perfect medium-rare, the meat itself was oddly bland and dense and had picked up little flavor from the grill. For me, the bun is key to a successful burger, but the soft, focaccia roll was the wrong choice. And maybe there's no such thing as too much of a good thing, but the burger was just too damn big. But the fries were good and I loved the house-made pickles. Service at the Village Pub manages to walk the line between attentive and discreet. The servers are professional and well versed in the menu. But toward the end of one meal, as we were anticipating dessert and then waiting for the bill, our server seemed to disappear. Desserts are just as strong as the rest of the menu. Warm oatmeal streusel with brown-sugar ice cream and a smattering of apple cherry compote tastes like it just came out of the oven. The tiny Mexican chocolate churros ($8) are delicate and light, until you factor in the cinnamon ice cream and chocolate sauce that comes with them. If you're hot-chocolate fan, be sure to try it here. Served like high tea, a silver pot of thick and creamy hot chocolate ($8) is served with chocolate marshmallows and whipped cream which you add to your cup as you see fit. In the post-dotcom era, Woodside feels immune from the clamor to make a buck on the valley floor below. Here in the foothills of the Santa Cruz Mountains, life moves with a casual grace and the rich stay rich. You want to live here but you can't. But you can eat here. And the Village Pub is still the place to do it. Address: 2967 Woodside Road, Woodside. Hours: Lunch 11:30am-2:30pm Mon-Fri, dinner nightly 5-10pm.